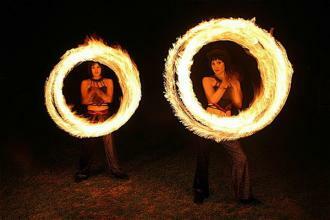 Extravagant but Elegant, Dynamic And Daring, FIRE IN MOTION brings Style and Grace to the Art of Fire Dance. 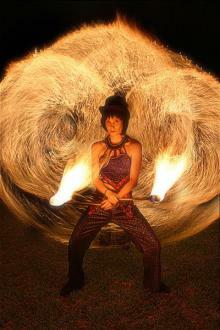 A Unique blend of Fire, Dance, and Courageous Skills, FIRE IN MOTION creates a Stunning visual display for any event or audience. 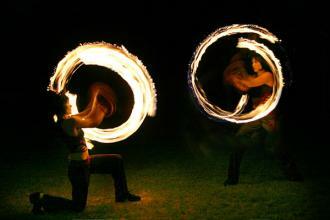 Utilising Fire Eating, Chains, Sticks, Clubs and Ropes of Fire, Fire in Motion brings together a sequence of Fire Dance pieces. Entwined in Luminous rings of light, these Delightful Characters emanate the essence of magic through the ancient Dance of Fire. A 2 or 3 performer show which includes the above skills as well as Fire Juggling, Diablo and Devil Sticks is also available. 11 minute Show to Soundtrack - 2 Performers. 15 minute Show to Soundtrack - 3 Performers. m* Available in show or improvised/meet and greet style. * Glow Show Available for wet weather alternative.